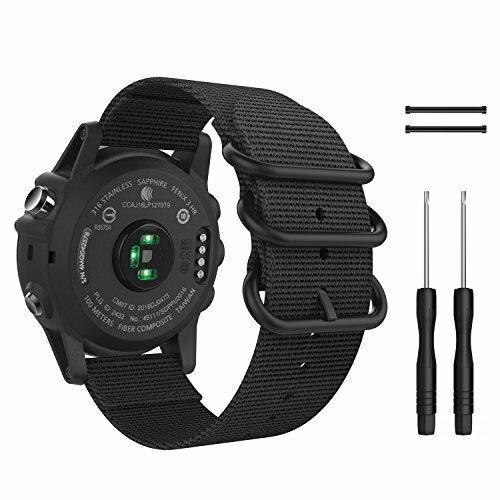 Custom designed for your precious Garmin Fenix 3 Smart Watch, this MoKo Garmin Watch Sport Band features a combination of functionality and style. * Personalized Your Garmin Fenix 3 / Fenix 3 HR / Fenix 5X / 5X Plus / Quatix 3 / Tactix Bravo / Descent Mk1 Smart watch with this refined nylon replacement wrist band with stylish design. * Band can be installed onto Garmin Watch Lugs(not included) on both ends precisely and securely. Easy and direct installation and one button removal. * Premium nylon material with moderate softness and fine craftwork make it comfortable to wear and durable, fashion, fit wrist, washable. * Fits 5.31"-7.87" (135mm-200mm) wrist. Come with 2 screwdrivers for connecting the band and watch. * Stainless steel buckles provide a simple and elegant appearance. Lightweight nylon wristband with textured finishing dresses up your smart watches. Personalized Your Garmin Fenix 3 / Fenix 3 HR / Fenix 5X / 5X Plus / Quatix 3 / Tactix Bravo / Descent Mk1 Smart watch with this refined nylon replacement wrist band with stylish design. The strap length can be adjusted easily.Fits 5.31"-7.87" (135mm-200mm) wrist.